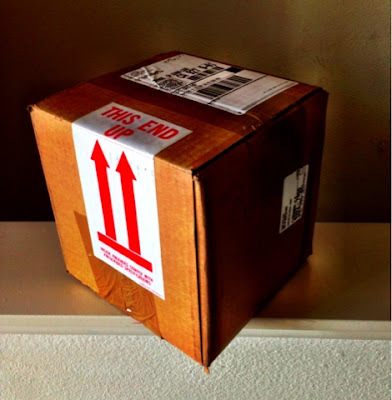 The Cupcake Activist: Will We Ever Solve the Cupcake Shipping Problem? Will We Ever Solve the Cupcake Shipping Problem? I was contacted by Angela of Making That Cake last month to try out her cupcakes. Angela has had her cupcake business for 6 years and is a winner of Food Network's Sweet Genius. She is located in New York and I'm 3,000 miles away in California. Not a problem, right? She offered to ship some St. Patrick's Day cupcakes to me. I couldn't have been more excited! And this was a first for me: I've never received cupcakes through the mail before. 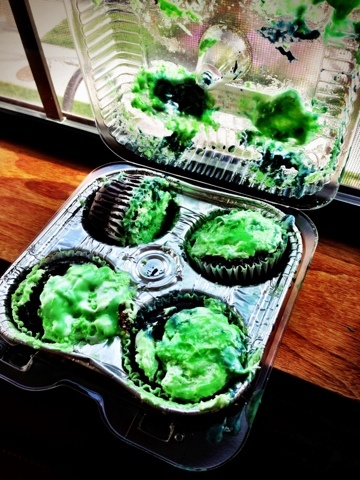 But what I feared most was a reality: the cupcakes didn't survive. Well, they did make it but it wasn't pretty. I felt so bad because I knew I couldn't review the cupcakes when they weren't in their perfect state. BUT just because the cupcakes didn't look pretty doesn't mean I didn't eat them. Yes, I ate the cupcakes and they were delicious! 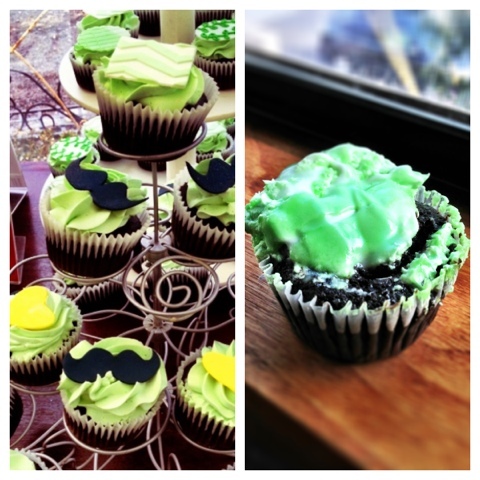 These chocolate cupcakes had a mint buttercream and a Bailey's filling. They were perfect for St. Patrick's Day. So here's a side-by-side comparison of how the cupcakes looked before they shipped and how they looked after. Not even recognizable. The cupcakes didn't survive the mail, but it didn't surprise me. Bakers all over have been trying to figure out the best way to ship cupcakes without having them fall apart during the shipment. The solutions I've seen are: shipping cupcakes in a jar, Cakes-Away postable cupcake boxes, and Cupcake Express. Will this problem ever be solved? On a side note, the next time I visit New York, I will definitely be trying more cupcakes from Making That Cake. I want a second shot to taste these cupcakes fresh and perfect as they should be. Thanks Angela! We live in DC area and I know that Georgetown Cupcakes won't ship past a certain area but they have a really nice cupcake holder box. Whom ever comes up with the cupcake shipping holder will be a genius!